Testing some 9x9 puzzles with larger cages. The one below should not be too difficult. Super, thanks… I like large cages with "train" of subtraction cages (a5–c6). By the way, it remembers me earlier 10×10 difficults (on Tuesday) which I’m missing. I agree with Tuesday’s 9×9 (especially, the yesterday’s puzzle was very challenging for me; and universally, I don’t like this shape of 9×9) ), however, large cages usually offer more possibilities and are – in my opinion – more amusing. To the second Patrick’s 9×9: This one was pretty hard for me. It took me about 3 hours. Though, if I had seen key by the "252×" cage earlier (a little hint – 3 × 4 × 7 instead of 2 × 6 × 7), perhaps it’d have took me about an hour. however, large cages usually offer more possibilities and are – in my opinion – more amusing. 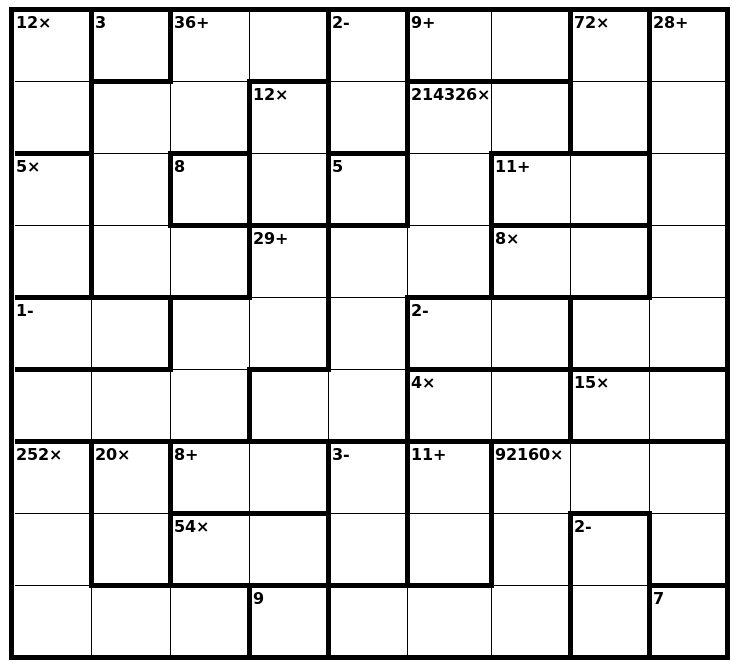 Large multiplication cages at least provide some clues. Large addition cages are mostly just dead space until you've solved enough of the puzzle to not really need too many clues anymore. Solving the pattern ones like Tuesday's generally boils down to quadrant parity, which is fine in the abstract, but (at least for me) tends to be frustrating in the application. like the 2nd one of these two samples). I just did the first 9x9 with larger cages that you posted. It was an enjoyable variation and, as you said, not too difficult. I look forward to trying the second harder one. I would suggest in the future using the colon for division rather than the traditional division sign. It would make differentiating addition from division easier. I would suggest in the future using the colon for division rather than the traditional division sign. It would make differentiating addition from division easier. Solution unique. The difficulty of this second 9x9 is undoubtedly related to the size of the cages (I specially like those two 8-cell multiplication cages ). I am sure this type of puzzle can not be solved by TAE (trial and error) and only by applying a systematic analysis one can arrive to the solution (and they require time). In this particular example, the puzzle admits a very nice analytical solution. Hint: after some initial preparation, we can use the product of the four 2-cell cages "8+", "3-", "11+" (f7-f8) and "2-" (h8-h9) (in the three bottom rows), which is equal to 30,240, to eliminate combinations. 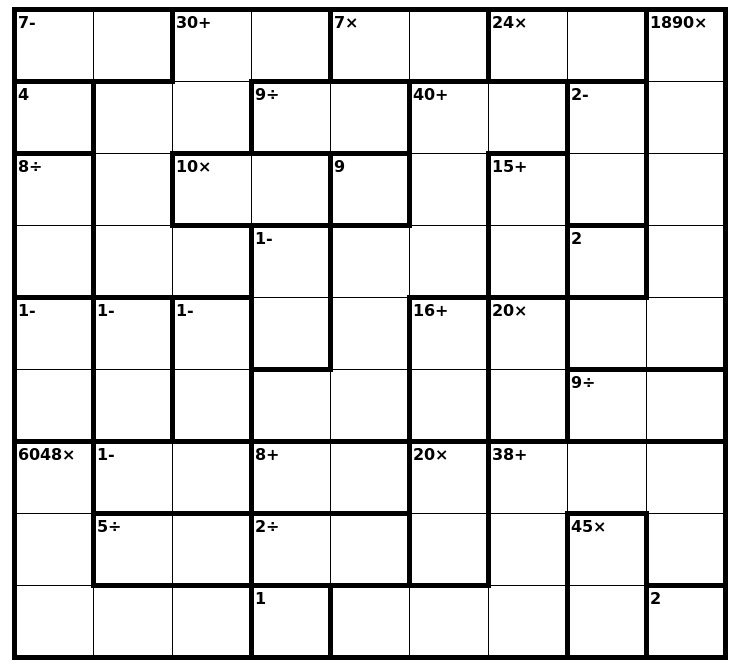 Edit: Would it be possible to know the rating of this puzzle?